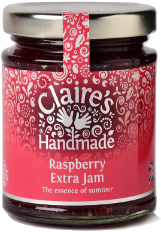 The welcome taste of summer is perfectly captured in this vibrant and delightful jam. Sensational, sweet and cheery. This vivacious jam will enhance any breakfast table. Wonderful on toast or waffles. Is also useful as an ingredient for vinaigrettes. Voted ‘best jam’ by our three young boys. Allergens in CAPITALS. Sugar, raspberries, gelling agent: fruit pectin, acidity regulator: citric acid. Prepared with 45g fruit per 100g. Total sugar content 63g per 100g.